Wayne Shearer’s Word War II Memoir, Part 2: Six Months After Dec. 7, 1941, Attack, Wanting To Be A Pilot – And Having Fun Before College! (Editor’s Note: Dr. Wayne Shearer, 94, is a retired optometrist and retired colonel from the U.S. Air Force Reserve now living in Hixson. 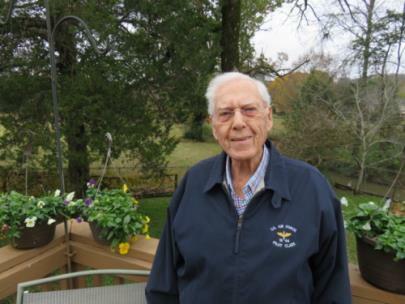 In his early 90s, he decided to sit down and write from memory and a few records he still possessed his recollections of going through Army Air Corps pilot training at several bases in the United States during World War II. A lifelong writer, he wanted to pen them as he remembered them happening at the time. About the time we were graduating from Cordele (Ga.) High School, the headline in The Atlanta Constitution on Wednesday morning, June 3, 1942, said, “BATTLE OF MIDWAY ISLANDS.” This was the start of one of the greatest early airplane victories. It opened with ineffective attacks by land-based American Air Force B-17s on the approaching Japanese fleet. Many aircraft were destroyed on both sides. Planes from the Hornet, Yorktown and Enterprise carriers found their targets. “GENERAL DWIGHT D. EISENHOWER ARRIVES IN LONDON,” said the headline in the Cordele Dispatch, on Thursday, June 25, 1942. He took command of all American forces in Europe. In the inside page was a half page devoted to: “CADETS FOR NAVAL AVIATION TAKE THAT SOMETHING EXTRA… HAVE YOU GOT IT?” A photo above the title showed a Naval cadet climbing into the cockpit of a trainer airplane. If you have, your country NEEDS you in a Naval plane NOW, it added. Recruits were to be given a comprehensive course of training requiring ten months to complete and were to be commissioned an ensign at a salary of $245 a month. To be eligible to take the training, the candidate had to meet these requirements: Age – 18 to 27; Citizenship – at least 10 years; Education – accredited high school with transcript of courses; Height – 5 feet, 4 inches to 6 feet 4 inches; Vision – 20/20 in each eye without eyeglasses and normal color vision; Hearing – normal; Weight – 124 to 200 pounds; Blood pressure – Systolic of 105 to 135; Teeth – minimum of 18 round teeth, two of which shall be opposing molars; Marriage Status – must remain unmarried until completion of pilot training. Right then, cadets were being accepted for training in four navigator squadrons in Atlanta. Four flying squadrons of hometown boys! Buddies who will live together, train together, take to the air together! Talk it over with your buddies; consult your parents – you’ve got to act quickly, the article said. Only four squadrons of 30 men each were planned. Cadets to win the coveted berths would fill the quota quickly! An Atlanta address for the Naval Aviation Board was listed. This type of advertisement got the adrenalin flowing in us “want-to-be pilots.” The Army Air Force pilot training recruitment advertisements were similar requirements, as the age was 18 to 26½ years, and in addition to the above required at least a grade of 75 on a tough, approximately two-hour written exam on various subjects; plus a preliminary physical exam to be passed on exam site. Qualifying to be an aviation cadet was more stringent for Army Air Corps pilot training. A short article about the Naval Aviation advertisement stated that their recruiters are to be at the Cordele High School auditorium from Atlanta on Wednesday of the next week. This sounds like opportunity to those of us who had built model airplanes, and our heroes were World War I pilots. After a quick conversation with my dad about him and me attending, he agreed to take me. He reminded me of my longtime aviation interest in World War I flying magazines about American and German pilot aces. He stated he did not want me to be in the Army, as he had been in the Argonne Forest, etc., trench warfare in World War I. The skies looked bluer as a pilot! About a dozen of us 17- and 18-year-olds showed up with our fathers, since with your father’s written permission at age 17 you could join, the small article stated. We all enjoyed the flying talk, the aviation photos, etc., but in the end Dad reminded me that I was still 17 and had been accepted at North Georgia Military College (NGC) for the fall quarter. My decision was to get as many quarters of college after my 18th birthday in August, which would prepare me for flight training in either Naval Aviation or the Army Air Force. I still couldn’t get flying an AAF P-40 fighter out of my mind. On the news front, the Cordele Dispatch on Monday, June 27, 1942, said: “HEAVY RAF RAID.” The Royal Air Force airplanes conducted a heavy night-time incendiary attack on Hamburg, Germany. The RAF bomber crew said that on the flight return to the English base that, looking back, they could see the city burning for a distance of about 100 miles. Also on June 27, at Americus, Georgia, an old World War I Army Air Field, Souther Field, where in May 1923, Charles Lindbergh paid $500 for a Jenny airplane and first soloed, the RAF cadets were training there, a story said, and had been since 1941. They would occasionally attend the Cordele Methodist Church in their blue uniforms. Could some of these pilots have been on the Hamburg mission? In not-so-good reading, the Atlanta Constitution on Sunday morning, July 26, 1942, said: “SECOND ATTACK BY BRITISH FAILS AGAINST ROMMEL.” This ended the first battle of El Alamain in North Africa. On the 13th of August I became 18 years old! Four days later, a headline in the Cordele Dispatch said, “FIRST U.S. ARMY AIR FORCES HEAVER BOMBER RAID IN EUROPE.” The Sotterville railroad yards in Rowen, France, was the target. As one last summer fling before going off to college, two carloads of us boys headed for the Jacksonville beaches on Labor Day. We got up early that Sunday morning and left at 4 a.m. to spend two days at the beach. We headed south on Highway 41. Four of us were in a 1939 Ford and the other four in another father’s 1938 Plymouth. We were happily and sleepily chugging along trying to follow the 65 miles per hour speed limit. Our friends in the Plymouth led the way. Being in the backseat of the Ford, I was half asleep but remembered passing Tifton, and when we got to Adel, we turned east to Waycross. There was no air conditioning in those cars, so windows were rolled down because it didn’t cool off at night. Someone remarked about the training of the aviation cadets at the Advanced Flying School at Moody Army Air Field at Valdosta farther down Highway 41. Several of us who were interested in getting into pilot training knew that Valdosta was fortunate to have been able to get a full AAF training base. We’d heard our dads discuss it. Poor old Cordele could only get a concrete landing strip for “touch and go” landings by cadets from Albany’s Turner Army Air Field. According to well-placed Cordele businessmen, the talk was that no local farmers wanted to sell the government a few thousand acres for an AAF base. The government found the land 65 or so miles north of Cordele and named it Robins Army Air Field. And, so, the farmers kept their land for cotton, peanuts and watermelons – to the Cordele Chamber of Commerce’s displeasure! As we got closer to Waycross, we discussed their Army Air Field, which was used at first to help the overload of final stage bomber training from Hunter Army Air Field of Savannah, later becoming a replacement facility for training fighter pilots. This fueled our increased interest of joining and being a part of the military. The cars turned south on state Highway 23 toward the Okefenokee Swamp and went through areas where no fencing was allowed in some sections for livestock to run free. Folkston, Georgia, was not far away. The morning sun was beginning to pierce the fog and mist of the Okefenokee and we were driving through it. The expectation of girl watching at the beach became more and more the topic of conversation. Suddenly we heard a large bump sound with pig squealing from our friends’ car in front of us. Immediately focusing attention ahead as bright braking taillights lit up, we saw a large hog inverted, flying up from the car’s hood. So pigs do fly! The squealing pig landed on its back on the car’s roof with all four legs thrashing wildly. As it slid off the car’s roof, the hog’s feet struck the Plymouth’s rear attached spare tire, causing it to break loose and roll across the northbound highway lane. Then it became like the circus get-away clown car! Next, as our car was applying brakes, it appeared as if the hog was chasing the rolling spare tire across the highway, all in front of a Florida turnip truck going north closely followed by a chicken truck. As the turnip truck slammed on its brakes, so did the poultry truck with a crate of chickens falling off and breaking open, and clucking chickens appearing to be chasing the hog into the swamp. All of this happened in a few seconds. As we got stopped and pulled off the side of the road, we could hear the hog squealing and thrashing through the swamp undergrowth as it kept running with the chickens not far behind. The damage to our friend’s car was a dented hood and top of car with the loss of his spare tire and wheel. He decided not to go back and look for them. Meanwhile, we couldn’t stop laughing about the humor of the scene of the flying pig as we continued on to Fernandina Beach at Jacksonville. The beach was nice and the girls were pretty, but it didn’t take us long to decide that the sailors from Jacksonville Naval Base were whom the females were interested in. We knew it must have been the military uniform that we’d all be wearing before long! The sunburn we got was a cause of painful concern as we drove back the next afternoon to Cordele with college on our minds.